Oliver Lief wrote: The $1000 Resolve license for Linux does NOT include Pro Res support, correct? Is buying the full panel still the only way to get Pro Res renders from Linux? Correct. You need the Advanced Panel license for ProRes renders on Linux. So I am over the moon Da Vinci Resolve is now on Linux. I tried installing it on an Ubuntu based distro and this is what I got. Anyone know how I can solve this and get it running I do have the icon running but it doesn't run. 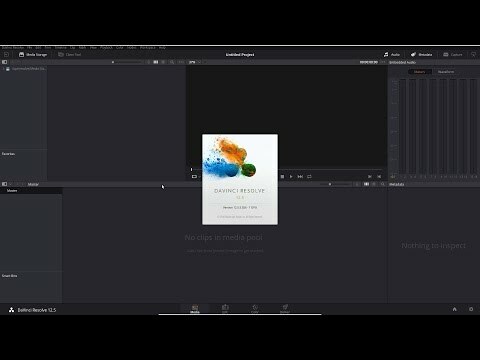 Michael de Meyer wrote: A question about the installation routine: I'm by no means a linux expert, but I was wondering if it wouldn't be easier to provide an Appimage version of Resolve, like for example Krita does? This would make Resolve independent of the linux distribution. The shell script they provide is already independent of any linux distribution, no need of an appimage. Does anyone know which BM drivers come with the Linux ISO? Also, does anyone know how to enable CUDA instead of OpenCL? Thanks! Hey! I finally get my davinci resolve on Ubuntu Studio. But i have the same problem, audio output is muted but i the program detects the audio and export the audio perfectly. Anyone solved the AUDIO output problem on ubuntu. Kuntal Majumder wrote: The shell script they provide is already independent of any linux distribution, no need of an appimage. no -- i don't agree. AppImage ar much more user friendly, but the a quite huge and do have some perfomance drawbacks as well. but the are indeed a very nice way to test new software. if BMD would use any of the common linux software package formats, you could translate it to an AppImage with minimal efforts, but in the case of a custom install-script a lot of manual intervention and modifications are necessary. What about a gui installer like fusion, with an option to disable panel manager daemon, most lite users dont need that running. In my understanding it first has to load all the necessary libraries, which are packed into the appimage. That makes the file little bit bigger, and it starts a little bit slower, but once it's loaded into ram, everything runs smoothly. Do you have experienced performance differences between distribution compiled programms and their equivalent appimages? Kuntal Majumder wrote: What about a gui installer like fusion, with an option to disable panel manager daemon, most lite users dont need that running. GUIs look more usere friendly and many customers may prefer it over simple command line scripts, but from a technical point of view they are quite the same. the real issue is more related to the fact, that it is very hard to control their behavior and compatibility from outside, prevent overwriting of existing files and guarantee a clean uninstall by system means. typical linux distribution specific packages, isolated file hierarchy oriented approaches and bundling as one sole executable, like in the case of AppImage, are much more easier to maintain in this respect. but in most cases (fusion, nuke, etc.) a simple checkinstall command is enough, to generate distribution specific package during the installation process instead of cluttering your machine in an uncontrollable way. in the case of resolve, this doesn't work sufficient right now, because there are so much additional fixes necessary. Daniel Tufvesson wrote: Regarding the all black video preview, try setting the video monitoring bit depth to 8 bit instead of the default 10 bit. i want to know the knowledge: what is problem for 8bit and 10 bit? can show me explaintion or wikipedia..
this is good for open mind..
Brandon Maytham wrote: So I am over the moon Da Vinci Resolve is now on Linux. instead that you are user user ROOT.. this is not correct..like as not best instal to user ROOT ok? good install to SUDO okay? for not running..or not work? .. this is problem for hardware: my case: my home computer is AMD phenom FX 1100T, is not worked..under linux opensuse 42.2, windows seven 64bit, nothing running.. instead my office box job: worked: because has INTEL DUAL XEON..this is sad for me.. I created a triple-boot to test: windows 10, centos 7.3 (clean install) and linux mint 18.1 (clean install) - here are my findings using identical hardware. I had no issues with CUDA or nVidia GPU driver installation. 2. Linux - audio levels responsive (in Audio and Master mixers), but not audible in playback. I checked the various preferences, and settings as mentioned in this thread, and I can safely confirm this is not a linux OS specific issue, in my case, it affects both Linux installs Centos & Mint. Has anyone found a work around for this issue? Blackmagic design ... thank you so much for the linux version of Resolve, this bug is the only thing stopping me from moving to a 100% pure linux post-production workflow. I can wait to see it resolved. The simple work around is to use one of our I/O devices for audio support. You could use something as simple as our $145 DeckLink Mini Monitor card, if embedded SDI or HDMI audio would work for you. Dwaine Maggart wrote: The simple work around is to use one of our I/O devices for audio support. Would any of the USB/Thunderbolt I/O's work? Dwaine Maggart wrote: Have not tested USB3. Does that mean that in theory, providing the driver worked, Resolve would recognize, for example, an Intensity Shuttle and use it for audio out? If so, it would make it possible to use a Linux laptop on set. Resolve 12.5.5 working on Centos 7.3. 3DLUTs work, but not DCTLs. Frédéric Devernay plugins work as expected, but my plugins only register as a single entry (no matter how many in the directory) and cause the native ResolveOFX to disappear. No plugin icon either. This link provides access to already compiled plugins of both my own and those of Frédéric Devernay. It worked until after the introductory tour, but when I clicked on 'Get started' the entire window disappeared. I tried clicking on the DaVinci icon in the side bar, it flashes but then nothing happens and it disappears. Reading forum posts, I see others have issues with crashes, but I can't get into the program at all to provide an activity log. I have a Intel Core I7-6700K CPU @ 4.00 GHz x 8 and a Intel HD Graphics 530 SkyLake GT2 graphics card. Easy peasy, since you have made it till the getting started screen, you have installed it correctly but you dont have a gpu(nvidia/amd) good enough to run davinci resolve. And from your age I am assuming you need a video editor to learn video editing? Isn't it? If that so try something simpler like kdenlive/openshot, davinci is not the right tool for learning video editing and that too in linux, where you need a bmd io card for getting sound output and no support for h264 for the lite version. Thanks - I will try kdenlive. Openshot is too basic for what I need. I already use Blender and I prefer to learn the basics in a challenging system with room for growth. if I try to lan mode, resolve detect the panel still I guess it's not supported yet. Hey Dwaine, not sure buying additional hardware is addressing the actual problem. It does not explain why the audio works on Windows, without the DeckLink card? Yet on the same identical machine, running Linux, it does not work? The OS has perfect working audio, it's Resolve 12.5.5 that does not. Can BlackMagic Design confirm that this as a known issue? (ie. are you guys working of a fix for this particular Linux bug)? Is there anything that we (the Linux users) can do, or provide, that will help the BM engineers replicate this symptom? yes that would be great. I also want to use Black Magic Resolve 12.5. with my Linux installation! Hope you can proivde a solution for the audio issue. Support for onboard audio on Linux is on the list of items we will get too but in the meantime Dwaine's suggestion of a Mini Monitor is a good one. Peter Chamberlain wrote: Support for onboard audio on Linux is on the list of items we will get too but in the meantime Dwaine's suggestion of a Mini Monitor is a good one. Wow thats nice to hear, does resolve LITE supports raw video formats on linux? Hey Peter (& Dwaine), thanks for the response. I am looking at Dwaine's recommendation, aka DeckLink Mini Monitor 4K - and I will probably pick one up this week. If BM is looking for Linux BETA testers, or has a BETA tester programme, please tell me where to sign up. Those of you who are having the 8bit/10bit preview problem on the color page, what source material are you using? Thank you Peter. Feels good hear you guys acknowledge this. I noticed something that may be of interest. When playing back Cinema DNG's, Resolve Studio leaves a lot (at least several hundreds) open file handlers pointing to the wave file within the Cinema DNG directory. Not a big issue but perhaps it's a clue to why the audio sub system is acting up. I noticed this by accident while I was browsing through camera SSD's looking for a lost clip and had to quit Resolve before every drive change to release the file handlers. Did a fresh install of Centos 7.3 and updated the Nvidia driver, but the plugins still override each other. DCTLs are now working fine. No audio, but this is consistent with everyone else's experience. I added the two remaining plugins (ResolveMath and LGGv2) to the repository. Kuntal Majumder wrote: Got it working in Ubuntu 16.04 , needed a few library linking though , just needed to install libssl-dev and libgstreamer-plugins-base0.10. Please tell me how this was done including the linking would love to get it to work on 16.04. Please take a look at my posts following that, you will get it. I dont remember the exact library names at the moment. Built on "Ubuntu 16.04.2 LTS"
I should add Fusion 8 works perfectly. Haven't had problems installing Resolve on Centos 7 and OpenSUSE Leap. Thank you BM for making Linux version - Resolve is such an awesome piece of software, glad to have ability to run it on my main workstation . Hope you'll be able to release version with properly running sound and h264 decoding (at the very least - encoding would be welcome too). Those 2 are a real letdown. I've been able to figure out "black" preview fix by myself by switching to 8bit mode, but I wonder if the same is needed on Windows/OSX. As others I got log4cxx errors on start , but haven't noticed those affecting the app so far. I've also noticed Resolve taxes cpu (2 threads if I recall correctly on CPU with hyperthreading) even on idle - no clue why. I'm checking out different export options now - at this point I'm struggling with getting 30fps output , as soon as I set it up I get "horizontal jitter". But that might be me not setting it up correctly (24 fps works without problems). Other than that the app runs fine so far and I'm super happy to have a proper video editor on my Linux PC. As for suggested "audio" workaround - does it work with Intensity Shuttle (USB 3.0 version)? I really have no use for decklink monitor pcie card, while a capture card/station would be something I could consider . Thank you very much for releasing this! Installed pretty well on a mid 2010 MacPro running Ubuntu 16.04 LTS with a Nvidia GTX960. Just had to install some dependencies and simlink the lib.so as mentioned a few posts above. Its the first step in the right direction and gives a lot of frustrated mac users hope to finally make the change to Linux and concentrate on work again (please no discussions about this). Przemek Jeske wrote: Haven't had problems installing Resolve on Centos 7 and OpenSUSE Leap. As far as I think Resolve was originally only available for linux , later it was ported to Mac and Windows , BMD just made a Lite version for linux users. H264 is available for Studio users in Linux, probably some license specific issues given that Linux doesn't have something like Quicktime. Well Apple stopped supporting the Quicktime for Windows a few years back, it is highly likely that BMD is working with something cross platform like ffmpeg for future Davinci versions and that H264 issue will be solved. It is confirmed that BMD is working on the sound issue for the future releases. And for that taxing on couple of CPUs , it happens because of the Davinci Panel Daemon, just rename the "DavinciPanelDaemon" executable in /opt/resolve/bin directory to any other name if you don't use panels to work with Resolve , this would solve the problem. And if you are trying to use Resolve as a Video Editor, please refrain from doing so, Resolve is first a CC tool then a video editor , if you want an industry grade Video Editor on Linux try Editshare Lightworks, it supports almost every second codec, has better editing tools than Resolve, has a Lite version which limits output to 720p and as an added bonus the new interface looks like Resolve. thx for the tips Kuntal. Will try renaming the panel daemon file and will see what happens with cpu usage. Kuntal Majumder wrote: Linux doesn't have something like Quicktime. but it does and you named it - ffmpeg . And that's not the only option. That's why I think issues with decoding/encoding on Resolve and Fusion are a bummer (not as big as sound issue, but still). Kuntal Majumder wrote: And if you are trying to use Resolve as a Video Editor, please refrain from doing so, Resolve is first a CC tool then a video editor , if you want an industry grade Video Editor on Linux try Editshare Lightworks, it supports almost every second codec, has better editing tools than Resolve, has a Lite version which limits output to 720p and as an added bonus the new interface looks like Resolve. Tried Lightworks and have to admit I didn't like it that much. The things I was able to do in Resolve straight away , without flipping through the manual have taken a whole lot more effort for me in Lightworks (heck, even transitions). Even though the new version , with new UI style is better, I still have more faith in Resolve. To be honest the only thing I really liked about Lightworks was the fluidity and speed with which it handled quite heavy files I've thrown at it. With Fusion and Resolve (plus Handbrake / ffmpeg cli) I finally feel I can work on videos on my linux workstation, without switching to an old windows box running HitFilm. Prior to that the situation on Linux pretty much sucked (at least in mid-tier). Przemek Jeske wrote: thx for the tips Kuntal. Will try renaming the panel daemon file and will see what happens with cpu usage. Oops, just a slip of tongue, it should be "Linux doesn't have Quicktime" . And yes Lightworks it not like the regular video editors out there in the market but once you get the hang of it, it becomes better than the rest. It's great to have Windows in the rear view mirror, but there are still a few items left before it's totally gone. There appears to be no way to read Sony F5/55 RAW files on Linux, since the AXSM reader requires a driver. So a Windows system must be available for ingest. I planned to use exFAT for transfers, but found that while SSD's formatted ext4 or XFS playback fine, they choke badly when formatted exFAT. Playback which starts at 24fps can grind to a halt, and Gnome can freeze for moments when copying from exFAT drives. So I'm transferring/re-formatting the SSD's now, and getting ready to reconfigure the Windows stripe set to a Linux RAID0. If anyone has any tips about the best method for stripping a RAID on Linux, or has a fix for exFAT, please chime in. Dwaine Maggart wrote: You could use something as simple as our $145 DeckLink Mini Monitor card, if embedded SDI or HDMI audio would work for you. Hi Dwaine, quick follow-up and for the people watching the no audio on Linux thread. Today my DeckLink Monitor card arrived, it took about 5 minutes to install, and the drivers where up and running without a hitch. So ... as of today I no long require my Windows 10 boot partition. The audio is working on Linux Mint 18.1 with the Decklink Card (Have not tested Centos 7.3 yet). Many thanks for the suggestion. Anybody with the same issue? Anybody with a solution? I have no problem playing stills. If you import a still in Media, right click and create a timeline from the clip, does it not play on the timeline in edit? I can capture stills, export them and apply grades from it. The only thing that doesn't work is play a still in the color pages UI viewer (nor on the external display) as a reference. The clip will wipe against a black window background... Weird though. Thanks Maarten, I'll give that a go. I still can't replicate your problem. I've tried .jpg, tiff, and .dng stills, and they all are fine in Edit and Color. I do remember some mention of bit depth being a problem, so you might try changing the preference settings. My problem targets the other kind of stills: the reference stills. Grabbing them from a grade and play them out again as reference.. In the meantime I ran into all other kinds of bugs, so I call it a day and better wait until for an update to come alive. maybe for future little feature for keyboard mapping (project settings): add new button for change mapping language (flag) ITa, ENG, US, etc etc.. I am using a debian-based os called Deepin and every time I try to install, I get this error. Could you please help me fix it? Last edited by Onur Çakır on Mon Apr 24, 2017 4:30 pm, edited 1 time in total.